Not only are you awesome but you’re a cancer survivor too! Show off your determination and perseverance by wearing our Cancer Survivor Long Sleeve Shirt. Our Survivor Shirt is available on our 100% cotton long sleeve shirt, machine washable in sizes youth S-L & adult S-2XL. Personalize your Survivor Shirt with any awareness ribbon color. 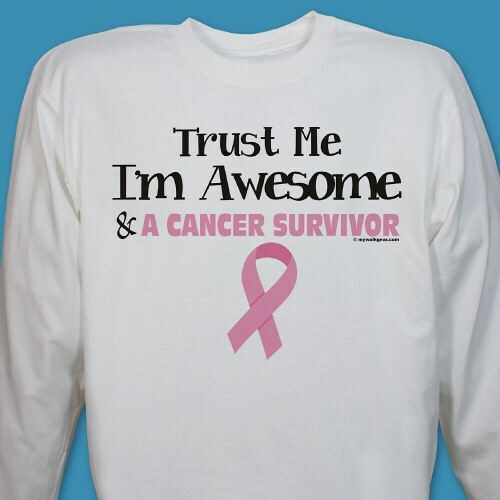 Additional Info Show off just how awesome you are with this Cancer Survivor Shirt along with our Cancer Survivor Key Chain & our Cancer Survivor Water Bottle as well. Shop MyWalkGear.com for all of your Cancer Survivor Apparel.